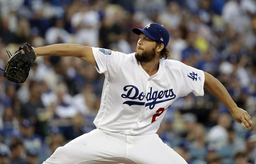 GLENDALE, Ariz. (AP) Clayton Kershaw has not yet been ruled out for opening day by the Los Angeles Dodgers despite all the time he's missed at spring training with a sore left shoulder. "I don't think we've made that decision yet and I know that Honey (pitching coach Rick Honeycutt) has mapped out where we need to be, so right now we're not ready to make that decision," Roberts said. "We're just right now in a day-to-day with Clayton and trying to keep him in a positive state of mind." Kershaw played catch with teammate Rich Hill on Tuesday's off day and lined up down the right-field line with fellow pitchers Wednesday as several played catch. Kershaw's partner was bullpen catcher Steve Cilladi. Prior to the afternoon throwing session, Roberts said: "The distance is increasing a little bit and most importantly, the intensity. So, for him to ramp up that intensity and recover the next day and still feel good, that's a good thing for us." As for when Kershaw will throw off a mound, Roberts said: "We'll know more each day. We don't have a day right now." After several days of practice and Cactus League inactivity because of a sore lower back, veteran catcher Russell Martin started hitting and caught Walker Buehler's bullpen. "Today is the first day I took some swings and I just got done, so it felt pretty good," Martin said. "Obviously, it wasn't max effort, but it was definitely positive." "So far, so good," he said. "We are taking it slow and trying to be smart about it." Martin's training room treatment has consisted of stretching, strengthening and "getting some range of motion and strength in that new-found range of motion, and hopefully, that will keep me on the field," he said. Roberts said: "It is kind of a day-to-day thing - depending on how Russell feels and the training staff - whether we get him some at-bats on the other side (in minor league games) or just jump him right in and DH or just kind of throw him in the fire. Russell, as a veteran player, knows exactly what he needs to do to get ready, so even a week down, I don't think it will impact him too much." NOTES: Buehler has not appeared in a Cactus League game. Roberts said the right-hander is likely to throw live to hitters on Saturday or Sunday. ... SS Corey Seager, completing his recovery from Tommy John surgery on May 4 and arthroscopic hip surgery on Aug. 7, was not in camp because of "a little kind of a sickness, a little bug," according to Roberts. Because of that, Seager's planned appearance in a minor league game Thursday is doubtful. ... Roberts and his staff will start to make cuts in the coming days, sending players to the minor league side. Position players will start to play in back-to-back Cactus League games, and starting pitchers will begin to throw increased innings in those games. ... The Dodgers optioned LHP Adam McCreery and reassigned LHP Josh Smoker and RHPs Joe Broussard, Daniel Corcino and Jesen Therrien to minor league camp.